Future Make Polyes Q1, is the world's first resin light curing 3D Pen. What does it mean? It means Polyes Q1 has all the capabilities of 3D printing pens without the pitfalls. It is the safest and environmentally friendly 3D printing pen. Our 3D pen uses cool ink, has a child safety lock and inbuilt battery so no hot parts, no melting plastic odors and no wires. From the totally safe and cool nozzle to sleek, optimally-proportioned body, the pen is as easy to use as it is very versatile. Polyes Q1 is 3D Pen that uses cool ink which means there is no hot parts so it's safe for children. The material is very strong and naturally extracted from plants so it's safe to touch. From now on you don't have to worry about the high temperatures and unpleasant odors as Polyes Q1 uses cool ink and avoiding all dangers. Flexibility and ease of use, portability and USB charge ensures convenience without the hassle and potential dangers of cord. Bought our 3D Printing Pen and created something amazing? Don't wait and share it with the world by leaving a photo review! 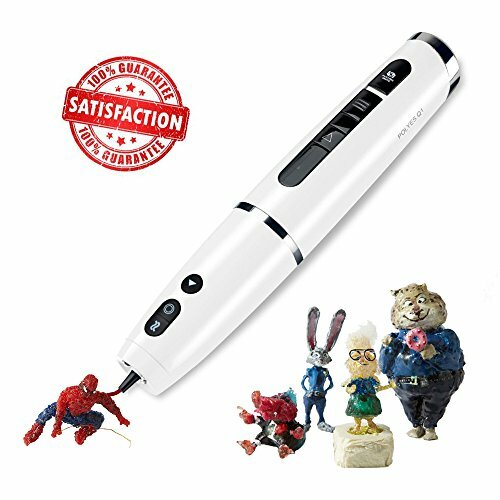 If you have any questions about this product by Future Make Polyes Q1 UV Light 3D Printing Pen, contact us by completing and submitting the form below. If you are looking for a specif part number, please include it with your message.